Running with your baby is a good bonding experience and is convenient for everyone involved; your baby gets to see the sights while you get in a some exercise. For this guide, we’re offering two best picks, based on how much you run and what else you plan on doing with your new jogging stroller. 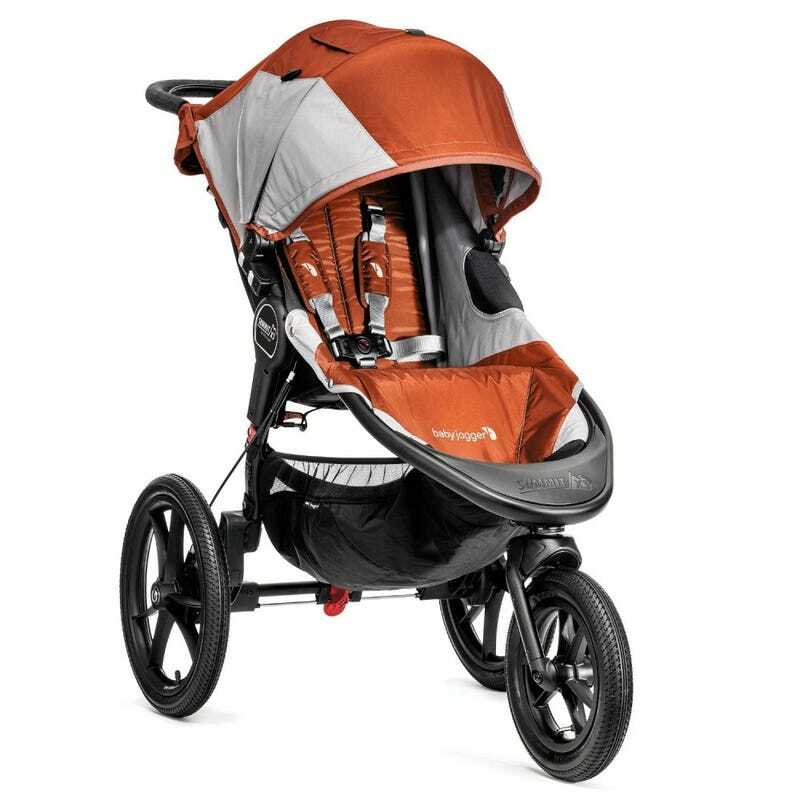 After 30 hours of researching and testing 15 jogging strollers, the Baby Jogger Summit X3 and the Thule Glide are the ones that i’d buy, but for different reasons. We’ll talk more about why later on. Jogging strollers are for parents who want to take their baby with them when they exercise, whether it’s for running, power-walking or just a vigorous walk in the park. We also found that many non-jogging parents prefer these strollers due to their larger wheels and better suspension systems, as they can provide a smoother ride. If you’re in the city or out in the country, the varied terrains of both can be hard to tackle with a normal stroller, so these work exceptionally well. They’re also great if you have a need for a stroller that has an exceptionally tall seat, or an extended weight capacity, as most jogging strollers are able to hold well over 50 pounds. What Makes A Good Jogging Stroller? You can run with just about any stroller, but why would you want to? Jogging strollers are specifically designed for the task of jogging, built in such a way to provide added comfort and safety when moving at high speed. When looking at a prospective jogging stroller, start from the ground up. The first things that you notice are the tires. Jogging strollers tend to have larger tires as compared to non-jogging strollers for better absorption of varied terrain. They also tend to be air-filled tires, like a car’s, which provide a natural cushioning from bumps. Next, you’ll typically see an exposed suspension system. This is necessary to provide a smooth ride in conjunction with the larger tires. As you get ready to buy a jogging stroller, consider your needs. Be practical: think about where you’ll be using it and how you’ll you’ll be using it. There are two types of jogging strollers: fixed wheel and swivel wheel. The first type have a front wheel that is permanently locked into place, providing a true jogging experience without the ability to steer the stroller, ever. You can veer to one direction of the other over time, but you won’t be making any sharp turns, not without lifting up the entire stroller. These are typically reserved for parents who are serious runners, and who run several miles at a time. A fixed wheel provides the best performance and a good value, seeing as they don’t have the everyday features that you’d pay extra for on a traditional stroller with swivel wheels. That said, when you’re at, say, the grocery store, you can’t turn your front wheel. You’d have to lift the entire front wheel up and turn the body of the stroller to change direction. Swivel wheel jogging strollers, like those from manufacturers such as BOB and Baby Jogger, have a locking mechanism that can be used for when you want to jog and can be unlocked for when you want to steer. This adds convenience while sacrificing performance. The locking mechanism can and will over time move one direction or the other, just like what happens to your car’s alignment over time. While it can be adjusted, it takes time and a fair amount of trial and error to do so. All that taken into account, the locking mechanism on a lot of the swivel wheel joggers we tested always felt loose, and tended to give our testers a “jumpy” ride. What does that actually mean? The front wheels of swivel wheel joggers, when locked, tended to move a bit in each direction as we encountered small bumps, pushing us off track and requiring more effort to keep a straight path. The fixed wheel joggers had no issues with this. If you can afford a standalone jogger, get one that has a fixed wheel. If you need a stroller that can pull double-duty as an everyday stroller and a jogger, get one that has a swivel wheel. For us, there are some must-haves on our jogging strollers. First, we love having a hand-brake. These provide added control over your speed and provide comfort when moving over varied terrain. Large diameter wheels are also a must. A few models that we tested, as well as the vast majority of non-jogging strollers, have wheels that are 12 inches in diameter or less. We prefer joggers to have at least 16-inch tires, as these provide the best ride, and feel much more balanced when at speed. If you need a stroller that can pull double-duty as an everyday stroller and a jogger, get one that has a swivel wheel. After we concluded our initial research we had a list of 15 strollers. We chose to test models that had consistently high ratings online as well as good reviews from the parents that we talked to. We then made sure that the remaining candidates had the features that we wanted: large diameter air-filled tires, a good suspension, high-quality fabrics and the ability to fold down into a compactly for storage. We took our top five candidates out into the real world for testing with four parents and their kids. In testing, we wanted to find out which stroller performed best for running, but also which stroller was the easiest to use in everyday activities and which ones fit our test kids the best. Our lineup of everyday activities included: grocery shopping, folding and unfolding the stroller, using the accessories and walking around the neighborhood. For performance testing, we asked our four sets of parents to run at least a mile per day with their strollers and log their impressions and mileage. Whether it was over pavement, parks or trails, we found that fixed wheel joggers offered a smoother ride with less bumps, making it easier to maintain a straight line. After we talked with our testers, we found that there were two distinct camps of parents that wanted different things from their jogging stroller. Some wanted a stroller that could be used for occasional jogging, but mostly for bumpy sidewalks. Others wanted a no-compromise performance machine that didn’t need to go anywhere but the trail. It was at this point that we decided that it was necessary to choose two best jogging strollers: one with a fixed wheel and another with a swivel wheel. After the dust settled, we chose the Baby Jogger Summit X3 and the Thule Glide as our best jogging strollers depending on how you plan on using them. The Baby Jogger Summit X3 ($430) is the best choice for parents who want a jogging stroller that can pull double-duty as a jogger and as an everyday stroller. The Summit X3 features a one-hand fold, a hand brake and a remote wheel lock for easy transitioning from having the wheel locked to swiveling. For walks in the park and grocery shopping, the Summit performed well, and was both easy to maneuver and fold down. When folded the stroller is compact and can be made even smaller by removing the quick-release wheels. Our testers did point out that the stroller was quite heavy, at 28 pounds, but that’s to be expected in this category of all-terrain and jogging strollers. And while it performed well in jogging and trail-walking, our testers had more difficulty controlling it as compared to our Also Great pick. The Thule Glide ($350) was each of our testers top choice when it came to running and trail-walking. The ride was smooth and felt exceptionally well balanced, even with larger children in the stroller. Parents of different heights rejoice; there’s an adjustable height handle. This way, you can get into your preferred stance for jogging or walking. Other features include a hand brake for better control over varied terrain, and a deep seat recline for napping babies. The best part? The entire stroller weighs only 22 pounds and folds with one hand. You also have the option to add accessories for your child, such as a tray or a car seat adaptor. Of course, the one thing that the Thule Glide doesn’t have is a swiveling front wheel. If that’s a must-have for you, the Baby Jogger Summit X3 is the better choice. The writers at Baby Gear Lab gave the Thule Glide a very positive review, citing its rich feature-set and smooth performance. Bob Revolution Flex ($390)-While a good option due to its large wheels and suspension, there are newer and better strollers that have hit the market since the Revolution became a ubiquitous sight on suburban parks and trails. Bob Ironman ($335)-This model didn’t perform as well (or look as good) as the Thule Glide, which is comparably priced with a much taller seat back. Bumbleride Indie ($500)- The Indie tries to do too much. In having a flat recline, big basket and car seat adaptor, it provides a lot of features but it falls behind the competition when it comes to jogging performance. Thule Chariot Cheetah ($475)-Well priced, until you add in all of the accessories that you’ll need to make it useful, like the jogging extension. Thule Urban Glide ($400)-A great all-around stroller, but for being a swivel wheel jogger, it didn’t have as many accessories or the flexibility of our best pick Baby Jogger Summit X3. Mountain Buggy Terrain ($500)- The newest Terrain has some welcome updates, but still trails similar offerings by Baby Jogger, BOB and Thule in regards to its feature-set and ease of use. Chicco Tre ($380)- This model felt cheap in our hands. The wheels weren’t close in quality to the others, and it seems expensive for what it is. A 2nd-tier jogger that’s made with a lot of plastic that weighs a ton. Graco FastAction Fold Jogger ($160)- Like the Tre above it, the Graco model is far from special. It was hard for our testers to get comfortable running with it, due to the awkward frame design. You get what you pay for here. Schwinn Arrow ($180)- Multiple reviewers cited the front wheel pulling hard in either direction to no avail. For a fixed wheel jogger, any of the other options will serve your needs better than this one. Baby Trend Expedition ($105)- Terrible wheels and cheap fabrics are just the beginning of the litany of complaints that consumers have had with this model. Steer clear of it! Taking your stroller out into the world and running with it can take a toll on the fabric, wheels and the frame. Following these tips will keep you out of the garage and on the trail. Your wheels need to be properly inflated to ensure the best performance. The PSI rating should be on the sidewall of the wheel or in your owner’s manual. A normal bike pump will do the job. The seat fabric should be cleaned if soiled by food, mud or whatever else happens on your run. Using a damp cloth and a mild soap and water solution should be sufficient for getting the fabric looking like new. Should an issue with your jogging stroller pop up, get in touch with the manufacturer to figure out how to best fix the issue. Thule offers a standard 10-year warranty on the frame and a 2-year warranty on the fabric and other parts. They even offer repairs through the company or authorized dealers based on the issue. Baby Jogger offers a lifetime warranty on the frame for the original purchaser and a 1-year warranty on the fabrics and other materials. In choosing two best jogging strollers we’ve given parents the best options based on their lifestyle. For parents who want a high-performance jogging stroller there’s the Thule Glide. A fixed wheel jogger designed just for running. And for parents who want the option to have a swiveling front wheel, the Baby Jogger Summit X3 is the best choice, combining a composed jogging performance with the conveniences of an everyday travel system stroller. Either way, you’ll have a stroller that will shoot down any excuses you have to hit the running trails with your kid.